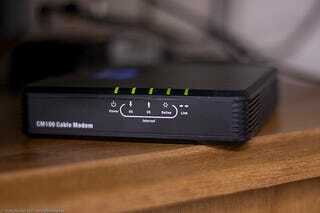 Matthew Delorey's business idea was to sell hacked Comcast modems which allow free Internet access. He just forgot to avoid FBI agents, conspiracy, wire fraud, and $250,000 fines. Now he may get 20 years in prison to rethink things. Delorey wasn't doing anything insanely difficult. He was just modifying modems' MAC addresses to match those of modems whose owners were old-fashioned and actually paying for Internet access. He would've probably gotten away with selling them for a while longer had some of his buyers not been undercover FBI agents. Whoops.